In celebration of Women’s Day, and in the lead up to the GBS Mutual Bank Mountain Drive Half Marathon, a number of local female runners are gearing up to race in the annual event. Here are just a couple of the ladies that will be participating in this year’s race. Sally Price-Smith (Right) is looking forward to the GBS Mountain Drive, after having ran in a number of different codes and distances all over the world. 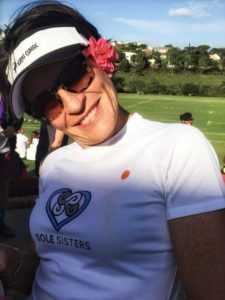 Sally Price-Smith has been running since 1989, and has participated in a number of different events in a number of different countries throughout these 29 years. From fun runs and hashing to marathons, and from trail runs to park runs, Price-Smith is committed to empowering women through running. Price-Smith believes that running is one of the most accessible sports to participate in, due to the fact that it requires almost no equipment. “Whether I run on my own or in a social group I can say that I always feel improved physically and mentally from the experience,” said Price-Smith. Price-Smith is particularly proud of the progress that women runners have made in the last 40 years, especially when looking at how the first female marathon runner, Katherine Switzer, was chased down the streets of Boston by race officials at the Boston Marathon as recently at 1967. Nicole Craig is ready to enjoy the fun atmosphere and challenge of the GBS Mountain Drive Half Marathon, after a long and slow winter season. Craig lives by the creed – “If it doesn’t challenge you, it doesn’t change you”. 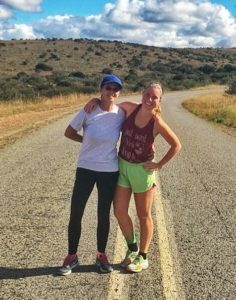 Tracy van Aarde (Left) and Grocott’s Mail’s own Kathryn Cleary will be tackling the GBS Mountain Drive half marathon this year. The dynamic duo of Tracy van Aarde and Kathryn Cleary have been training together ahead of the GBS Mountain Drive in order to tackle the challenge as a team. 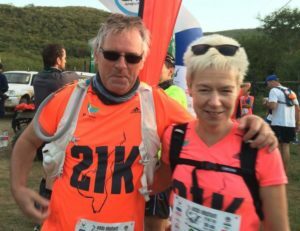 Grocott’s Mail’s own Cleary has only been running long distance for a year, while her partner in crime, Van Aarde, has been at it for two years. “I think we have trained appropriately for [the GBS Mountain Drive].  We are lucky to live in Grahamstown, so we are able to train on the mountain,” said Cleary. The duo started training together almost a year ago. “It’s definitely more fun to train together,” said Cleary. “A lot of laughs, a lot of screaming.” “And some good motivation,” added Van Aarde. The duo believe that everything in life needs balance, and in order to get the most out of training, you need to balance training, work, relaxation, diet and everything else.